Samba! Unbelievable sight to behold sitting beside a highway in the southwest corner of North Carolina. 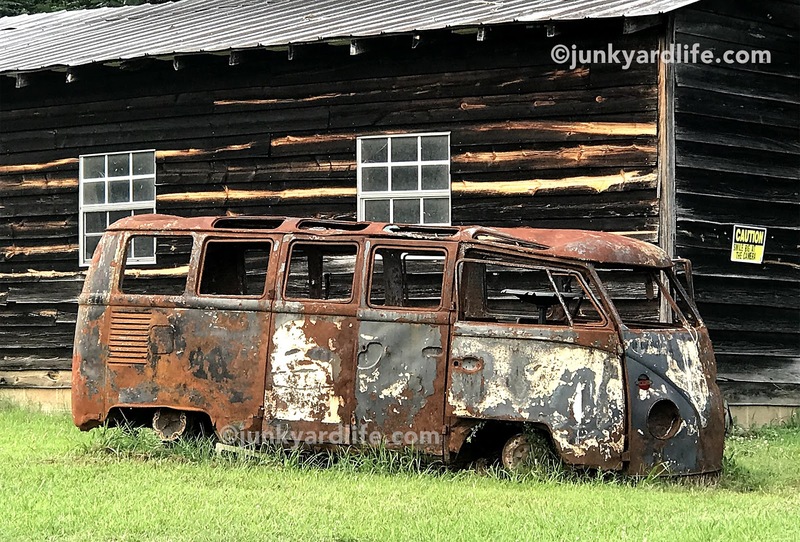 It was a 21-window VW Bus or Samba for those with uber Volkswagen knowledge. A crustified shell for certain. No glass, scant paint, zero interior, no trim, no wheels. Drivetrain? Ha! Are you joking? But there it sat in the Appalachian foothills. Beside an outbuilding covered in rough hewn wood, a mere 25 feet from the roadway. Stickers bearing the Harley-Davidson name and a faded confederate flag adorned the doors of the makeshift garage that flanks the VW bus. A bright yellow and black sign warns, "CAUTION: Smile big at the camera," for those who stop to look at the burned shell. I’m guessing plenty do. A nearby house and the sign must be enough to keep the Samba safe. 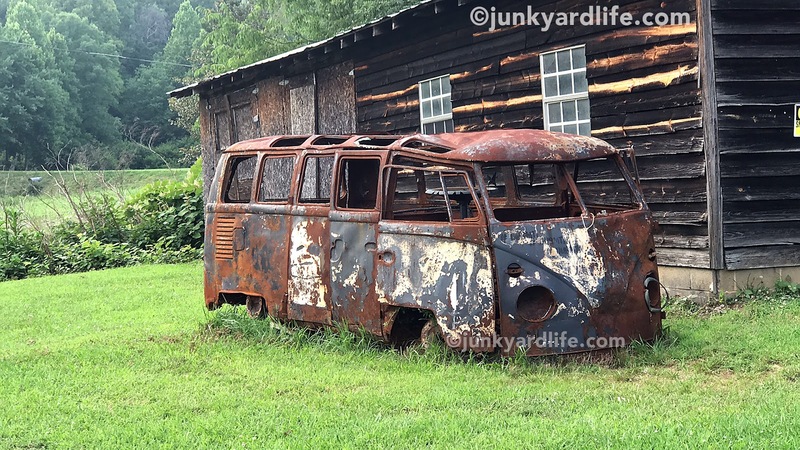 Even in this condition a VW Samba bus (23 and 21-window varieties) brings ridiculous money. $85,000 is not an unheard of price for a complete basket case. Or, so I’m told by those seemingly knowledgeable VW folks that I talk to at car shows. Maybe they are sharing the legend perpetrated on TV? "In nice, driver condition $135,000 is a common asking price." Really? I’m not sure who buys a $85k basket case? But that means there is money to be made at the low end, if you can dig one of these up. Whether it be out of the woods, buried in a swamp or a battered, burned wreck out of a junkyard. Don’t worry, I’m looking too! A yellow sign warns that visitors should smile because you're on camera if you stop to look at the 21-window VW Samba bus. I didn’t have the courage to bother the owner with my questions. They no doubt have heard them all. Yes, they know what it’s worth. They don’t want to sell. If you have to ask, "how much?," you can’t afford it. Carry on. The 21-window Deluxe Microbus/Samba models were built between 1964 and 1967. They featured a large canvas sunroof. The 23-window VW Deluxe Microbus/Samba was built prior to 1964. The Volkswagen bus, known as a Transporter, Microbus or just plain VW Bus originated in 1950, but they were not exported to the United States until 1952. Only 10 were sold in U.S. that year. Success and sales followed the split window bus through 1967. In 1968 they were redesigned and the split windshield, and V-indention on the front body panel was no more. 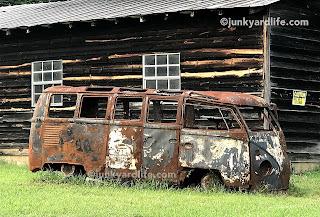 Many different models of the VW bus were available touting their functionality and fuel economy. Buyers could choose from a Deluxe Microbus (extra window varieties), Pick-up, Double Cab Pick-up, Camper, Station Wagon, Deluxe Station Wagon, Kombi and Panel Delivery transporters. I’m no VW expert, so mileage may vary on my accuracy. Please drop me a note if I’m wrong about something in the story. I probably am. 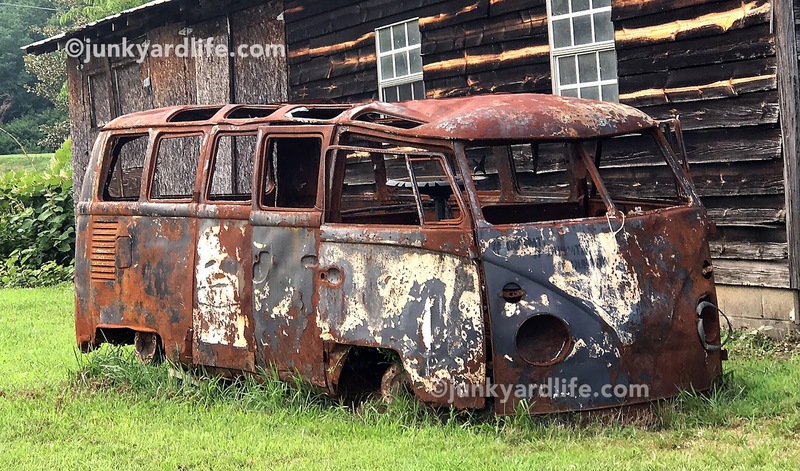 No windows, no paint, no wheels or drivetrain. The rusty, burned VW Samba’s remains still turn heads.